Looking to Participate? New to Hockey? 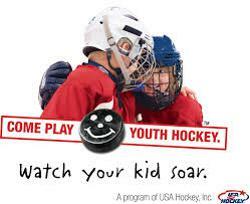 BDHA offers both learn to skate and learn to play hockey programs for girls and boys, ages 3-4 and up. All programs at the introductory level are free and children can join at any time during our 7-week sessions, which are offered all year. BDHA Is also offering a 7-week Hockey 3 & 4 program for skaters with more experience and are looking for more advanced skill development. This will typically enroll skaters at the 6U-10U levels. Next session starts March 21. See schedule at left. Register for all programs on the link below. Did you hear about the sport from a friend or neighbor and want to find out more? You're in the right spot! We offer programs for boys and girls, ages 3 and up. If you have a child that is interested in hockey regardless of age, or program, have them check out one of our free intro to hockey resources located in the right-hand column. Our site has a tremendous amount of info so please read through the pages and tabs. Can't find what you are looking for? Just email us and we'll be happy to chat with you. Hockey is one of the fastest growing youth sports in the country right now. Don't worry if your kid has never played, our well-trained coaches and practice environment will allow them to learn how to skate and stickhandle in no time. Our introductory program includes Hockey 1 & Hockey 2 and Girls Developmental that are offered in FREE, 7-week sessions throughout the year. While the base fee is waived, USA Hockey requires an annual fee of $50 for youth ages 7 and over participating in hockey. For those who sign up for our "Try Hockey for Free" Sessions held November 11, 2018 and February 23, 2019, the USA Hockey fee will be waived for the year (or the remaining sessions in the season). Please go the Hockey 1 & 2 and Girls Developmental webpages for more information on each program. Hockey 1 & Hockey 2 and Girls Developmental are our beginner/entry level programs in which participants will learn how to skate and be introduced to hockey play. Participants are formally trained how to skate in a progressive and sequential manner by skilled skating instructors. We recommend all skaters complete both before advancing to the Mite level or team play. While Hockey 1 and 2 will focus on beginner skating skills, Hockey 2 will begin to introduce participants to the fundamentals of hockey play. A station format will be implemented to enable skaters to learn a multitude of skills and advance at their own pace. Equipment will be provided for beginner level hockey programs with check-out and return required. The next 7-week Hockey 1 & 2 sessions start March 21, and Girls Developmental on March 22, 2019. Join at anytime during these FREE sessions. Girls can join both Hockey 1 & 2 and Girls Developmental.